50 pp Whole No. 57. January 1855. Vol VIII. No. 1. The New Jersey Medical Reporter: A Monthly Journal of Medical and Surgical Science, edited by S. W. Butler, M.D 195 pp. Brown leather cover, no illustrations, Fourth Edition with some additional observations. 111 pp journal on nursing. The 'Trained Nurse and Hospital Review' was the pioneer nursing publication in American and it ran from 1893 to 1950. This item is the September 1926 issue. The front cover features a photograph of Stella Boothe Vail (a prominent nurse of the times and a specialist in children's health and hygiene) done by H. W. Simmons. Some of the articles in this issue are: "The Nurse's Part in Prenatal Care", "Helps in Pediatric Nursing", "Nutrition Forum: Food to Tempt Children's Appetites", and "A Guiding Code of Ethics in Nursing Relationships." Item includes a newspaper article on Stella Booth from the NY Sun Globe, March 1924. Measures 10" x 6 3/4" (journal), 9 3/4" x 7" (newspaper article) . Minor cover wear. Pages are toned due to age. The article has red pencil on the bottom detailing the name and date of the newspaper. 24 pp prospectus and promotional brochure encouraging individuals to become sales agent for the Egyptian Drug Company selling Egyptian Regulator Tea. A buy low, sell high scheme including illustrations and text promoting the teas effect on indigestion, pimple, boils, old sores, ulcers, dyspepsia, corpulency, sick headache, rheumatism, nervous debility, neuralgia and premature old age. Additionally includes numerous testimonials. The back cover depicts a scene on the plantations of the Egyptian Drug company, at Karnak, Upper Egypt. Additionally, includes an order form and a single fold pamphlet titled "The Secret of Beauty" with before and after illustrations to be disseminated with the product. With original envelope. Brochures measure8 1/2" x 6". .
Popular. Edition. Lesson 1. 26 pp. Stiff wrap with image from photograph of Lust. The treatment includes a show with a special shower head at 8 to 14 feet with special attention to the stomach and intestine, followed by a bath, an "internal bath", the consumption of "Inner-Clean" taken daily, following Ehret's Mucusless Diet and much more. This is follwed by pages of diagrams illustrating the tehnic(sp) of the Blood-Washing Method. This is only part one. Part II begins on page 13. The inside covers promote "Yungborn", in Butler NJ - The Original Nature Cure Resort and Recreation Home, Dr. Lust's Health Resort, Tangerine FLA and a promotion for Lust "A Dignified Profession -- Doctor of Naturopathy. The last pages of the book promote such things as Cure by Water - The Kneipp Method, The Nature Method of Healing by F. E. Bliz, and much more. Measures 9 1/2" x 6 1/2". Fading on cover.. Dr. Benedict Lust. President of the American Naturopathic Association, Dean American School of Naturopathy and Editor of "Naturopath" Magazine. A 10" x 6" page that appears to have been removed from a ledger or journal with two entries that appear to be in different hands. 4 1/2" x 3" some staining on cover, some foxing, spine loosening in areas, hand corrected address on title page and page 98's advertisement for the reader An 18 pp pamphlet with paper wraps. An address to the Gentleman of the Graduating Class, November 4, 1869. 8 1/2" x 5" Some missing pages at front, inscribed and has hand written notes, foxing throughout, wear on cover A 20 3/4" tall die-cut easel back paper doll depicting Katrina Knickerbocker holding a bottle of Dr. Miles New Heart Cure. 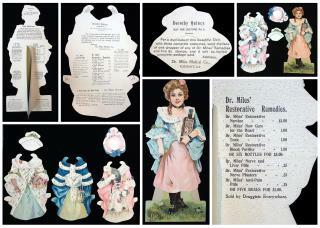 The reverse introduces Katrina, a character in Rip Van Winkle and of course promoting the various Dr. Miles with brief narratives and a complete product listing including pricing. Also includes three costumes and hats. The costumes are identified e.g. for a stroll on the Bowling Green. Each costume has product information on the reverse. The paper dolls were offered as premiums for a product label and five 2 cent stamps. . An 8 x 11 sheet with engraved patriotic imagery designed to be cut and assembled to create a perpetual calendar. Two (2) tabs to be cut and inserted to provide the days of the week and the months and the days in a month.